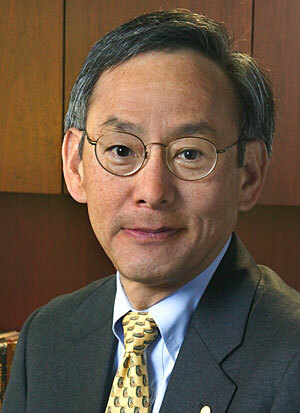 Steven Chu (born February 28, 1948) is an American experimental physicist. He is known for his research in laser cooling and trapping of atoms, which won him the Nobel Prize in Physics in 1997. His current research is concerned primarily with the study of biological systems at the single molecule level. He is currently Professor of Physics and Molecular and Cellular Biology of University of California, Berkeley and the director of the Lawrence Berkeley National Laboratory. As global warming warnings grow more dire, Chu is pushing his scientists at Lawrence Berkeley National Laboratory and industry to develop technologies to reduce the impact of climate change by reducing greenhouse gas emissions, and he has joined the Copenhagen Climate Council, an international collaboration between international business and science, established to create momentum for the United Nations COP-15 climate negotiations in Copenhagen in December 2009. Chief in Chu’s campaign is an unprecedented research pact reached between UC Berkeley, oil industry giant BP, the Lawrence Berkeley Lab and the University of Illinois, which has drawn considerable controversy. Nearly US$400 million in new lab space will expand energy-related molecular work centered at Lawrence Berkeley that involves partners around the world; a US$160 million Energy Biosciences Institute Helios Building is to be funded by BP and subsidized with $70 million of California state funds, house up to 50 BP scientists in a private lab, and will include Chu’s separate solar-energy program, but is reportedly on hold due to “geotechnical issues”. According to MSNBC and other media outlets, he is President-elect Barack Obama’s choice for Secretary of Energy. No user commented in " Steven Chu "